Winner: National Geopgraphic Traveller Reader Award for the Best Travel Book of the Year 2016 and also the winner of the Books are my Bag reader Award for Best Autobiography 2016. Twenty years ago, Bill Bryson went on a trip around Britain to celebrate the green and kindly island that had become his adopted country. 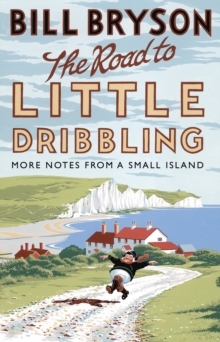 The hilarious book that resulted, Notes from a Small Island, was taken to the nation’s heart and became the bestselling travel book ever, and was also voted in a BBC poll the book that best represents Britain. Now, to mark the twentieth anniversary of that modern classic, Bryson makes a brand-new journey round Britain to see what has changed. Following (but not too closely) a route he dubs the Bryson Line, from Bognor Regis to Cape Wrath, by way of places that many people never get to at all, Bryson sets out to rediscover the wondrously beautiful, magnificently eccentric, endearingly unique country that he thought he knew but doesn’t altogether recognize any more. Yet, despite Britain’s occasional failings and more or less eternal bewilderments, Bill Bryson is still pleased to call our rainy island home. And not just because of the cream teas, a noble history, and an extra day off at Christmas. Once again, with his matchless homing instinct for the funniest and quirkiest, his unerring eye for the idiotic, the endearing, the ridiculous and the scandalous, Bryson gives us an acute and perceptive insight into all that is best and worst about Britain today.